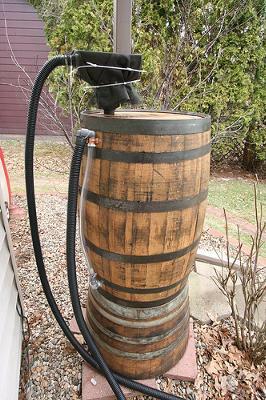 My rain barrel once held over 50 gallons of a rye whiskey distilled in my home state of Iowa. I chose the wooden barrel for effect and because I am such a fan of the whiskey. I used many sources online for designing my barrel but ultimately created my own final design because I wanted features I couldn't find on any other site. I created my own inflow-box design using downspout components, sump-pump tubing, fiberglass screening and other components. I created my own overflow design because I wanted to determine how full my barrel would be at any given point. I use my rainwater to irrigate my rose and vegetable garden in the drier months of the summer and I have had very good results! Join in and write your own page! It's easy to do. How? Simply click here to return to How Do You Save Rain Water.